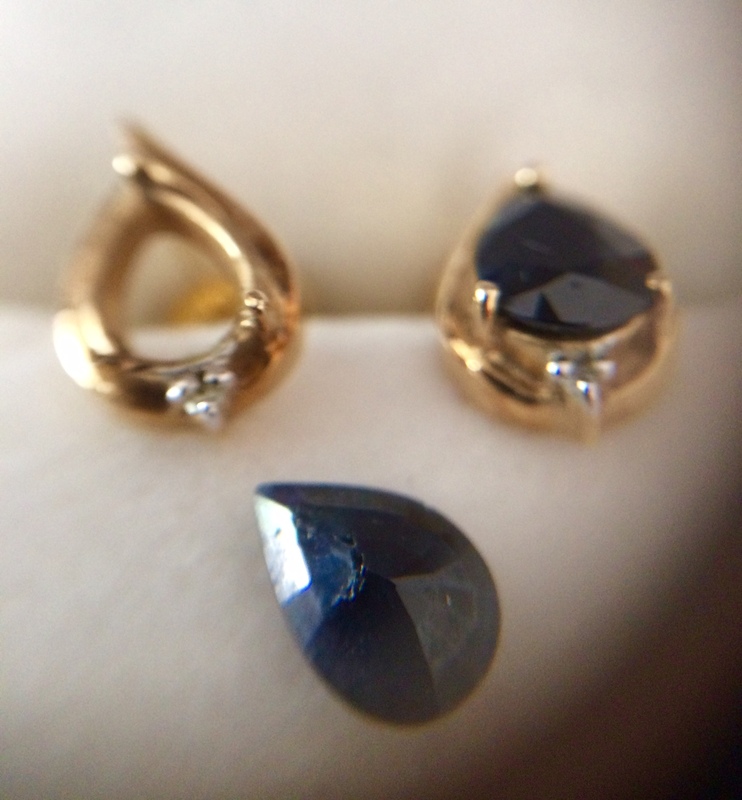 My lovely sapphire earrings, a gift from said DBEM on my 55th birthday, came apart. How fortunate this happened at home and I didn't lose the stone. I'm quite sure my friendly neighbourhood jeweller will be able to reset the stone. At least I hope so. And while he's at it I'll get him to check the setting on the other also. Such pretty earrings! Sounds as though the check on both would be a Good Idea. Yes. I would have been upset to have lost the stone as I've not the budget to pay for a replacement. Having it reinserted and the claws tightened is more within my "fiscal policy". As you say, thank goodness it came out at home. Would have awful for you to lose the stone. Yes I am pleased these can be repaired. I'm rather fond of these earrings. Oh no, lucky it did happen at home! Totally fixable and preventable in the future. I have a jeweller in the local village who will be able to fix this for me so that's good. Oh my - that's one of my nightmares, and part of the reason I hardly ever wear jewelry! I'm glad it happened at home, and when you were paying attention as well. I'm pleased the stone fell out as I was removing the earrings. If it had fallen even inside the house I might not have found it.